Georgetown bids adieu to the venerable Fr. James V. Schall, S.J. Last Friday, Fr. James V. Schall S.J. delivered his final lecture as a professor at Georgetown University. The lecture, entitled “A Final Gladness,” focused on Fr. 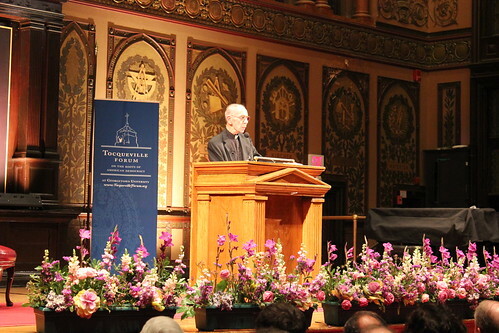 Schall’s area of expertise, political philosophy, and featured the mannerisms, good-natured humor, and breathtaking insight that have won him the admiration of generations of both faculty and students throughout his 34 years at Georgetown. Schall was born in 1928, and after serving in the army, joined the Jesuit community in 1948. He graduated from Georgetown University in 1960, and served in San Francisco for 17 years. He then joined the Georgetown Government Department where he has remained for the last 34 years. In 1960, he wrote his doctoral dissertation, which he ambitiously titled, “Immortality and the Foundations of Political Philosophy.” Since then, he has authored numerous essays, articles, and books that have brought him renown throughout his field. ← We Are Georgetown: Men’s basketball takes on Longwood tonight at 7 p.m.
A fine and mostly accurate report. The title is a bit misleading, since official Georgetown did not take part or support this event. The event occurred through the extraordinary efforts of one student in particular, and was financially supported by external sources. The President was otherwise occupied, as was the Dean. Had it been left to official Georgetown, all that would have taken place was a small reception of faculty colleagues, sans students, over hors d’ouvres. Official Georgetown never realized or appreciated what it had in Fr. Schall, though everyone else certainly did. Georgetown will never be the same. Enjoy your deserved rest, jvssj. We will pray for you. I’m sure the “culture” at Georgetown is happy to see him go. The dean had a date with Sandra Fluke already scheduled.